Truline Post Drivers introduces the new T REX bale shredders designed to feed round or square bales of any size. The feeder can load and carry two bales. T REX bale shredders feature a tipping platform that can be used to feed into feed pads or over fences. As the feeder is designed in a V-section, the narrow profile makes it ideal for fitting on feed pads or get through smaller gateways. 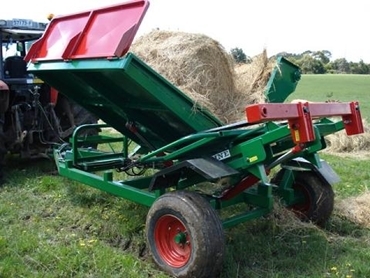 A full backing gate can be attached to the T REX bale shredders, allowing the user to fill the feeder with 4.2m³ of pit silage, making the shredder a very versatile machine. T REX bale shredders come standard with adjustable tow hitch, large flotation tyres and a four-hose or two-hose configuration.